Volunteering is a great way to support our teachers and our students, and there are lots of ways you can help. Whether you can only offer an hour of your day or several days, we have a way you can help. Please see the events page below for volunteer opportunities. If you have questions about volunteering, click the button below to contact our volunteer coordinator (and vice-president), Summer Remmert. If you aren't able to volunteer your time, please be sure to visit our fundraising page for other ways you can help our school. We have been very fortunate in the past to have a great group of parents supporting our school with their time and efforts, but we need more help from existing and incoming parents. Do you have a "little" time to give? If so, please considering volunteering!​ Please open the document below with volunteer opportunities. If any of these position(s) will work for you, contact your PTCO board ​with your preferences. Any help will greatly benefit our students, staff, and school. We thank you in advance for any and all help that you can provide. Remember...when we all do a little, it can add up to a lot! Below, please read about more upcoming events with the event description. We will have several volunteer opportunities for many of these events. You will notice an "I Can Volunteer" button near the events we are needing assistance with. ​This event is held on the day the class lists are posted for viewing outside the school. The class lists will be posted by 4:30pm. 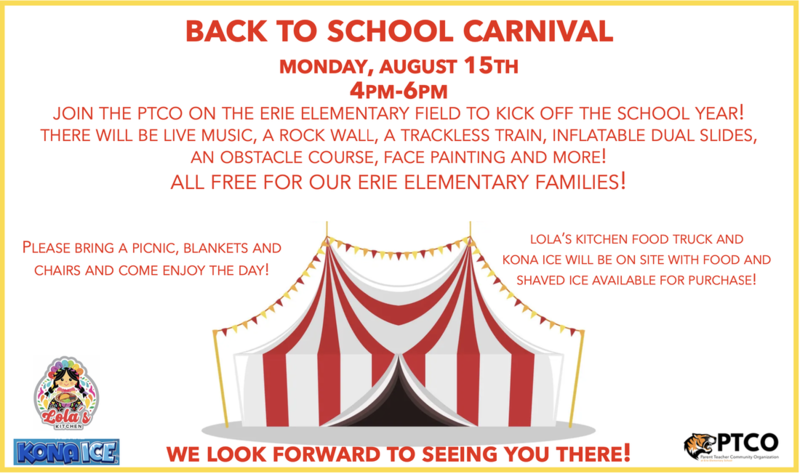 We will have free popsicles, generously donated by Kona Ice, for all the kids so they can mingle with other students and kick off the school year with confidence! Kona Ice will also be available for purchase and 20% of the sale will be donated to our school!! ​PTCO Info will be provided. Take this opportunity to drop off those supplies before the first day of school, see your classroom and learn more about opportunities to become involved through your PTCO. You only need to come to one of the two time slots available unless you have more than one classroom/teacher to visit because you have more than one child attending EES. During this time, you will be able to meet your child's teacher, sign-up to volunteer, and get valuable information about school, the class, PTCO, etc. ​No volunteers needed for this event. 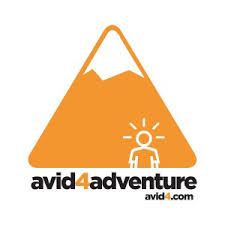 ​ Through our fundraising, The PTCO is able to allow Avid-4-Adventure off-campus experience for our 5th graders at Boulder Reservoir. ​Their outdoor education program is designed to children to active outdoor pursuits, teach them the fundamentals of environmental stewardship, foster their personal development, and strengthen their team building skills. This program is deeply enriching and thoroughly fun. ALL students must have a signed waiver to participate. Please visit avid4.com to complete the waiver. Come join us for our monthly meeting! We will be meeting in the library. Help us brainstorm, discuss upcoming events, and learn about what is happening at Erie Elementary School. This is a great opportunity to meet other parents and to support the students and staff. This is our biggest and ONLY fundraiser we do all year long If we raise enough money, it allows us to put on fun events for free or at very low costs. It pays for field trips, technology, teacher grants, and much more! Parents - Your child will come home with a donation form/envelope in early September. Their goal is to raise as much money as they can. Ask your family, friends, neighbors, and businesses. Check with your companies. Many corporations will match your donation, doubling the amount raised. ​Rewards - A fun experience (to be announced) will be awarded to the top male and female donation collectors in the school. The top class who raises the most money will also received a fun TBA experience. ​Jog-a-thon day - There will be a track lane set up in the open field of the school yard along with some fun music. Each grade will come out at their scheduled time slot during the day and run for a predetermined amount of time. A different grade level will be out with your child's grade keeping track of each student's lap count. Families are welcome to come out and support their kid during their time slot (just check in with the office before coming to the field). We will also need volunteers to help this even run as smooth as possible. Please click on the sign-up genius link below to volunteer to help with this event. ​Upon completion - Bananas will be available to munch on and water. Stop by The Old Mine and/or Sweets (Briggs locations only) on September 18th to support Erie Elementary! Have dinner and dessert with friends, and EES receives 15% of sales made ALL day. 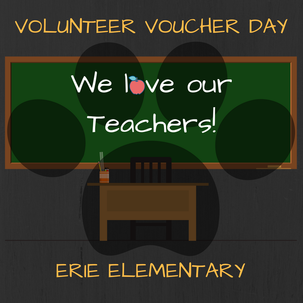 Teachers are encouraged to fill out "Volunteer Vouchers" for tasks that parents can complete for them. These tasks will include things such as replacing bulletin boards, sharpening pencils, cutting, organizing a bookshelf, photocopying, laminating, and other various tasks inside or outside the classroom. Some tasks are needed to be done at school, but others can be done at home. The time commitment will be small, but the impact is sure to be large! Come speak with your student(s)' teacher to learn about how their year is going and to speak about goals, work, play, etc. An email was sent out to schedule convenient times to meet with your teacher. If you have not received this email or have forgotten your time slot, please contact your child's teacher or call the office at 303-828-3395. ​Help feed the teachers for conference nights. Sign up link below! Eat burgers, raise bucks for Erie Elementary School! Come out a support our school and community. 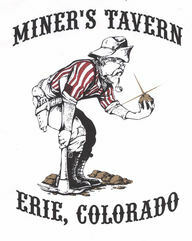 Miner's is generously donating 33% of the full day's sales to our school. ​Please mark your calendar and plan for an easy dinner from Miner's! ​Come join us for our monthly meeting! We will be meeting in the library. ​Help us brainstorm, discuss upcoming events, and learn about what is happening at Erie Elementary School. This is a great opportunity to meet other parents and to support the students and staff. This event will be held in the Erie Middle School Cafetorium. The PTCO supplies everyone with popcorn and water. 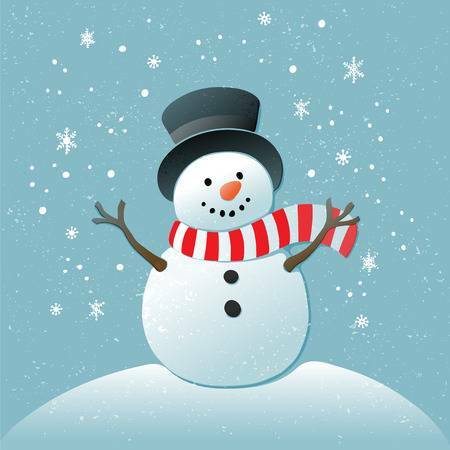 The kids can wear their pajamas and bring their pillows, bean bags, blankets, and stuffed animals with them for a fun filled evening. Movie Christopher Robin. Plan for a "good 'n fast" dinner at U-Turn BBQ in Lafayette on November 13th! Erie Elementary earns 15% of all sales! Thank you for your support of our local community and school! ​This year the PTCO is sponsoring a surprise Art project for every student to bring home over Winter Break. In order to make this happen we need parent help! I highly encourage you to volunteer for a different class then your child's, so you can be fully surprised when they bring home their project over break. Please consider helping out so we can continue to do fun projects in the future. ​Please Note: 2nd grade and 4th grade are divided into 3 groups. If you want to be with your child, ask them what group they are a part of. Come. Sit. Stay. Visit "the original Lazy Dog" for an easy dinner on Tuesday, December 4th, that benefits both our school and local community. A portion of the night's sales comes back to Erie Elementary PTCO-- Thank you for your support! During this week, each class will shop during their normal library time, so only one class will be in there at a time and they will still have time to checkout books as well. It is a wonderful way for kids to independently do their holiday shopping for family members, friends, etc. There are gift selections at a wide range of cost. The kids will bring their money to school in envelopes labeled who they are hopping for. There will be volunteers there to help the kids make their selections and all gifts will be wrapped. We need help! Please sign up below. Also look for info in your child's Friday, Dec. 7th Friday Folder. Support your school and community while also enjoying a dinner you don't have to prepare. Between 10am and 12am on 1/22, Papa Johns will give 20% of all sales back to Erie Elementary-- Carry out or delivery! Be sure to mention the school AND your child's teacher's name. The classroom with the most visitors wins a FREE PIZZA PARTY courtesy of Papa John's. Thank you for your continued support! Formerly the "Darling Daughter Dance," this year the PTCO has opened up our formal dance event to entire families! We hope this will be a fun opportunity to get all dressed up and spend a special night with your kids and other EES families! This event will be held in the Erie Middle School Cafetorium. Dinner, desserts, drinks, and many fun surprises are in the works. This event is open to all Erie Elementary students and their immediate family members. More information and a paypal link will be posted once tickets are available for purchase. We will be asking $10 per family to attend. We have a limited number of tickets available-- they will go on sale 1/11. Mark you calendars, and we hope to see you at this year's PTCO Snow Ball! Grab a burrito for dinner between 5pm-9pm, and help support fun events for our Erie Elementary students and teachers! Please remember to mention EES when you order, and we will receive 33% kickback for all purchases. Thank you to our parents and community for your continued support!! oAuditions will be submitted via email only! Send a one minute clip of your audition to Lauren.Griffith@icloud.com no later than Monday February 11, 2019. Audition Piece must be the same piece you will perform for the Talent Show. All acts will be limited to 2 minutes for the actual performance. Talent show is Friday March 15th with a Dress Rehearsal Thursday March 14th. Come early to school and enjoy breakfast along with coffee and juice in the gymnasium. There will be a craft for the kids to work on as well. Please allow enough time to get through the line and eat, so come early! Join us for a restaurant night at MICI handcrafted Italian. 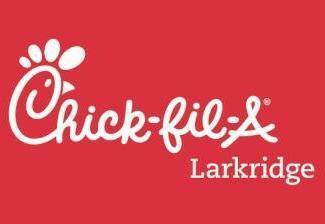 Erie Elementary will receive 20% back on all dine in, carry out, catering, and delivery orders between 11am and 8:30pm-- You must mention Erie Elementary when ordering! Thank you for your support of our community and our school. About Mici: MICI is short for our family name, Miceli. We’re local now, but have roots deep in Italian soil. Where we come from, food is a big deal. For us, meals are celebrations of family, good food and culture. In our homes, we believe in exceptional ingredients, tradition and value – all of which carry over to what we offer at Mici. Our recipes have been in our family for generations, and our dishes are named for the people and places that mean the most to us. We make our pizza dough fresh and cook it directly on a stone deck. We hand-roll our meatballs just like our great grandfather did. We simmer our sauces for hours to bring out the rich, complex flavors. We cook with love and take our time to craft distinctive dishes that aren’t just filling, but deeply satisfying. It’s just what we do for family. The actual talent show will be held in Erie Middle School's cafetorium. There will be something for ALL the participants at the end of the show. We're excited for your child to bring their talent to share with others! Please join us for another AWESOME PTCO family event! Formerly the “Super Son Event,” we have made a few changes— All EES students and their immediate families are invited for a night full of frantic fun: family relays, photo ops, games, Abo's Pizza, root beer floats, and many, MANY fun surprises. Mrs. Apple, our EES P.E. teacher, will be joining us to referee the fun! Families are encouraged to dress in a theme (any theme) for a chance to win prizes-- we can't wait to see what you come up with (this is certainly not required). We look forward to seeing you at the All-Star Relay! Tickets available Friday, March 15th via the PTCO website (see link on home page). $10 PER FAMILY. Join us at The Old Mine on Tuesday evening, 4/9, to support your school and connect with other families from EES over delicious pizza! Top it all off with an ice cream cone from Sweets (3pm-8pm)! Mention you are with EES, and a percentage from both restaurants comes back to EES PTCO-- Thank you for your support! See you there! In partnership with our generous sponsors, AR Workshop Boulder and The Fowler Group, the Erie Elementary PTCO would like to invite you to a (first annual) community-wide charity event: MOM PROM 2019! Tickets for this event are $40, and will be available for purchase on April 1st, 2019. $20 from each ticket, plus additional funds raised during the event, will go directly to the local non-profits that make our town and schools great: the Optimist Club of Erie, Erie Uplink, and the Erie Community Food Bank. Your ticket includes entry to the event, dessert, photos, swag, and (2) drink tickets. In addition, there will be a small silent auction consisting of many "self care" and delicious items to bid on. All proceeds will be added to our donation. There are a limited number of tickets, and this event will sell out. Grab your friends, and get your tickets quick! WHO: All Erie Moms-- What a great community event to unify all the schools! 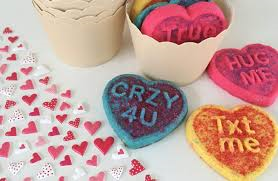 Moms attending our 80s/90s themed Mom Prom will be encouraged to tease up their hair, wear their prom-, formal-, wedding-, bridesmaid-dresses of old, and arrive for a themed evening of dancing, posed prom photos, a ridiculous amount of dessert, and a (cash) wine bar. A "Prom Queen" will be crowned, as well as awards for best hair (spray), most vintage dress, best dancer, and more. We cannot wait to share this fun evening with you-- What an incredible opportunity to bring us all together and give back to our community at the same time! Mom Prom 2019. Be there or be square. 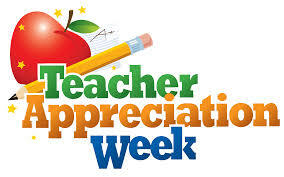 This is a very busy week and a much needed week to show all our appreciation to our teachers for everything they have done throughout the entire year! There will be a ton of meal preparations - both breakfasts and lunches, as well as presents and surprises for all the teachers every day of the week. We need a lot of volunteers to help with this week! This is our end of the year celebration. The PTCO has a company that comes in and sets up game booths, bouncy houses and courses, and a prize table. There will be popcorn available and there will be food trucks where you can purchase food and snow cones. If we raise enough money at our fundraiser, this event will be free for all Erie Elementary families. If you have an older child that needs community service hours, this is an excellent event for them to volunteering at to earn some hours!